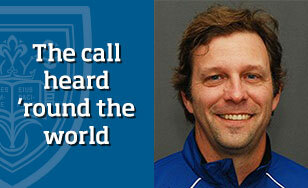 The Star Tribune of Minneapolis sums it up as "the call heard 'round the world." People on social media are talking about "goosebumps," "tears," "best since 'Do you believe in miracles?'" St. Scholastica's own Chad Salmela has become a part of 2018 Olympics history for his emotional color commentary as the American women dramatically won the U.S.'s first-ever gold medal in cross-country skiing. This is the fourth Olympics as an NBC commentator for our cross country running coach and former Nordic ski coach, who this year is performing his duties from the network's International Broadcast Center in Stamford, Conn. The Duluth News Tribune's story has his own reactions to the event and its giddy aftermath. So does Minnesota Public Radio. "Definitely the greatest live broadcast call in Olympic history," says Yahoo Sports. "NBC's call of historic finish is golden," exults the Star Tribune. Other chatter includes Deadline Hollywood, as well as Slate.com, Perfect Duluth Day and GoMN.